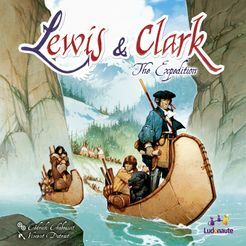 Lewis & Clark is a board game in which each player manages an expedition intended to cross the North American continent. Their goal is to be the first to reach the Pacific. Each one has his own Corps of Discovery that will be completed by the Native Americans and the trappers met during the journey. He has to cleverly manage his characters and also the resources he finds along the way. Beware, sometimes frugality is better than abundance. Lewis & Clark features dual use cards. To be activated, one card must be combined with another one, which becomes unavailable for a while. Thus, players are faced with a constant dilemma: play a card or sacrifice it. During the game, each player acquires character cards that enlarge his hand, building a crew that gives him more options but it needs to be optimized as he will recycle his cards more slowly. This new “handbuilding” mechanism fits strongly with the historical background. Since the aim of the game is to be the first on the Pacific coast, the timing and the opportunistic use of the other players’ positions are crucial.